Multiple materials can be optimized in a single project allowing for layout optimization to use all CPUs and CPU cores in your system making it a true multi-processor layout optimizer. 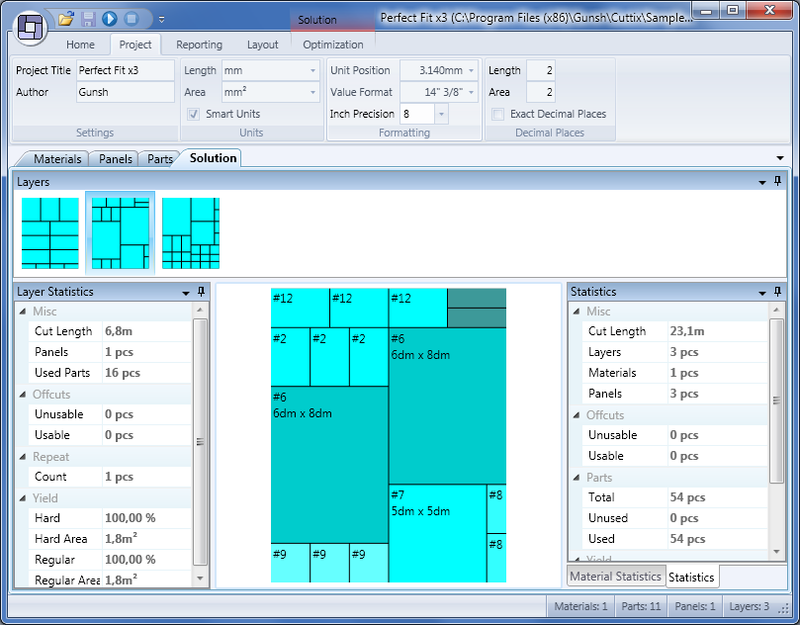 Cuttix optimization software always finds optimal layouts for very complex mixture of available panels and parts. Panel sheets dimensions may be specified as inches/feet or metric units with fine control over precision, decimal places and number display style. Our layout optimization softwar is easy to use with clean and intuitive user interface. For beginners we recommend our Quick Start Guide to get you started with your optimal layouts in no time. Qweas is providing links to Cuttix 1.2.767 as a courtesy, and makes no representations regarding Cuttix or any other applications or any information related thereto. Any questions, complaints or claims regarding this application Cuttix 1.2.767 must be directed to the appropriate software vendor. You may click the publisher link of Cuttix on the top of this page to get more details about the vendor.